KOSMOS Pen By Stilform – Stilform are the masters of pen engineering. Take inspiration to invent with the KOSMOS Pens unique mechanics. rOtring Rapid Pro Mechanical Pencil – Never set anything in ink first. The rOtring Rapid Pro Mechanical Pencil gives you the amazing feel and control of a pen. MRF Credit Card Multi Tool – A ruler for when you need it and 30 other tools for everyday situations. 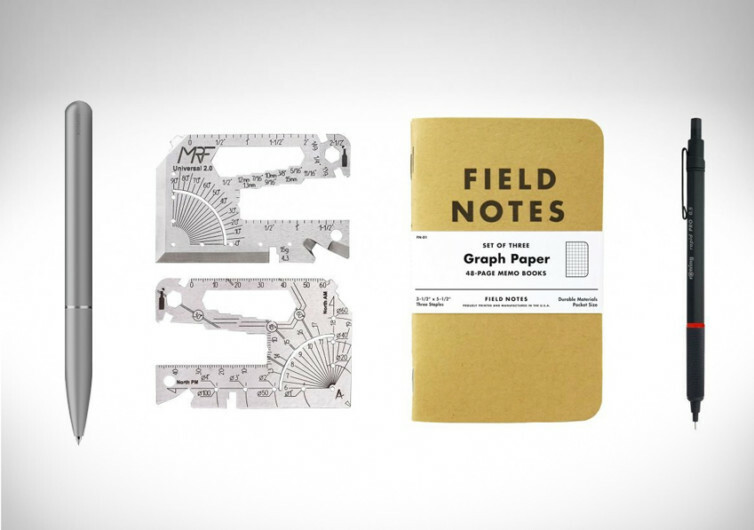 Field Notes Kraft Graph Notepad – Put all your ideas and designs down on the graph paper to be as accurate as possible.